On the news, the narrator tells the world that Cat Grant addressed reporters today to outline President Luthor's plan of meta-human orbital defense, to combat a potential alien invasion. In a small, out of the way diner, Clark and Perry talk about Clark's undercover reporter assignment. Luthor's been covertly mining Temeryl through a subcontractor, and the EPA would flip, should they be provided evidence. Clark will use a fake ID, go in undetected, and try to get some evidence against the President. Perry hands Clark some letters intended for Superman, and they depart each other's company. The next page is a spread of Superman rescuing some people from a crashing plane. The foremen rushes the men to keep them on schedule, telling them to ignore certain things they seem concerned about. A worker named Jerry talks with Jon (Clark's code name) about getting a beer at the only place in town that serves drinks, the Sinkhole. Clark/Jon asks about why everyone's in such a rush and so secretive. Jerry suggests that it's because Temeryl is so poisonous and the backer of the operation is not very concerned about safety. He also tells Clark/Jon that Temeryl, when mixed with certain chemicals, can make a compound much worse than napalm that can work in the vacuum of space. At the Sinkhole, Clark/Jon stops a fight about to begin, and when they tease him, he says it is so the workers won't be banned from the bar. He offers to buy both of the angry men a beer. A reporter on the television talks about the relevance of the missile program to the metahuman population, and Jerry tells Jon/Clark that Lex is looking out for regular Americans. Clark asks him what he means. Jerry tells him that he doesn't believe Superman cares about ordinary guys, and that he might not even exist. Clark tells him not to worry about Superman...Jon/Clark is there to buy beer for him. Clark breaks into the office and finds a document. It tells the benefactor (presumably Luthor) that Temeryl mining goes well, all miners are well screened, and safety aside, production can be sped up. It also illustrates that all communication is shredded within two days of receipt. Clark tells Perry that he couldn't get the document, but he read it, and he describes it to him. Perry tells Clark to keep trying. Six days later, the mine collapses. Jerry is trapped, but he is saved when Jon rises shirtless from the rubble with glowing red eyes and saves him. Jerry takes back what he said about Superman. All of the miners are saved. At home, Clark reads the letter. It is in Spanish. In Guatemala, Superman arrives in response to the letter, dated long before his stint as a coal miner. He finds a nun and a doctor pulling the sheet over a dead mother. Superman has arrived too late. He finds Emilio, the young boy who wrote the letter outside, crying. Superman tells the boy that he's an orphan too, and the city can adopt him, just like the world took Superman in when he was a boy. The boy tells Superman that he wishes he were his father. Superman hugs the boy. The town arrives to take care of the boy, and Superman tells them that it will be all right. Superman attends the funeral, and a grateful Emilio waves as Superman takes off. Story - 1: What we have here are two stories that could have been good, could have made their own issues, fleshed out a bit, but did not. Add into this the fact that it's essentially the same story that we've heard for the last few months, barring Ending Battle, and the result is a re-run. I hate re-runs. I turn them off almost immediately. I had to summarize and review this one, so naturally, I'm going to be honest here. Is there anything at all really dynamic about Jerry or Emilio? Well, Emilio is sad and Jerry drinks beer. Wow. I did both of those things, once. I can relate. Just not as much as I would if these were more than the most general, stereotypical of people. Are there any real motions in this plot? Did Luthor come any closer to getting taken down? No. How many stories have we had in the last six months where a small, unknown character in the Superman mythos runs into Superman somehow, meets his end or nearly meets his end, Superman suffers and learns from it, and nothing has really moved forward at the end of the story. Off the top of my head? 5. The black policeman, the Italian newspaper man, the cancer patient, Emilio, and Jerry the construction worker. There are probably more, but that's the top of my head, folks. How many characters do we have already established in the mythos that are dying to have their rightful turn with Superman of late? Many. Lois. Jimmy. Perry (this issue went a way towards fixing that). Ron Troupe. Bibbo Bibbowski. Hell, Krypto, Ceritak, Ashbury, or Dirk Armstrong, for that matter. Why not kill Dirk? He's been working with Clark (presumably) for five years now, and we haven't seen him in almost three years. What if Dirk fell off a bridge into, oh, who cares, Darkseid's arms? Add a human element, and we have the same story we've been fed for the last few months, only with some relevance. Clark spends what, a month in this mining place? Two? When's he being Superman, having the Ending Battle, or, for that matter, staying married to Lois? If I were apart from my spouse as much as Superman and Lois are, I'd have long since called it quits. Heck, if I were Krypto, I'd have run away to Uranus or Apokolips or something. Clark buys people beer. Way to set an example for the kids. Why couldn't Clark get the document? He's SUPERMAN, for crying out loud! He could have done a million things to get that document. Like, say, grabbing it, flying at super-speed to another state, making a facsimile, and then returning it to its proper place. Not to mention the fact that if security was so tight that Superman himself couldn't make a copy, perhaps they just, I don't know, might TAP THE PHONES and hear everything Clark says to Perry? It doesn't wash with me. Those are the inconsistencies. Then there's the peculiarities. A translation might have been nice for at least some of the letter that Clark received. I know that it's arty to let us find out the contents on our own, but like the books on writing comics tell me, the audience should be allowed their dumbness, and intent should be clear and plain for the reader. 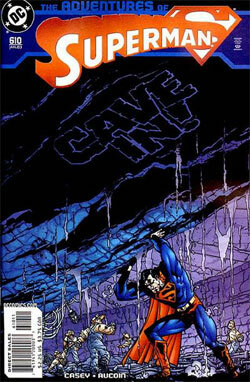 Knowing that there was danger in the mine and not doing anything about it was not very Superman-like. There's an annoying comic in the middle of this piece. There's a whole splash page of what seems essentially filler: Superman saving a plane that has no relevance to the plot. We no longer have letter pages. Goodbye Baldy. It was nice to know you. I think now the new writers and Eddie Berganza have systematically killed everything that made Superman great in the mid nineties. Great job, guys. No triangles, no continuity, really, no baldies. Marvelous. Add in the fact that this comes after an off and on good/bad miniseries that was supposed to be THE event of this year, add in the fact that the potentially marvelous Luthor Knows plotline went absolutely nowhere, add in the fact that last issue Superman killed again, and has, in fact, been relatively unchecked and irresponsible for the last few months with his powers, add in the fact that we're losing one of the four major titles, add in the fact that I am tired of saying add in the fact, and there you have my basic feelings on this issue. It was human. Yes. It showed Clark being a reporter. That's an interesting new angle. An arty one. It was cool once. Even twice. Even thrice. Now it's just repetitious, and these comics need blood, and they need it bad. Please, someone, bring Superman back to life. Art - 3: This style was never my favorite Superman style, but it manages to tell the story rather well and follows the plot in a consistent fashion. It is average, nothing special, nothing terrible. It's nice that certain inconsistencies that could have been (Clark wearing glasses as the miner, then suddenly being Superman) never happened. Normal work. Bad logo? Yes. SUPERMANS? I still don't get it. Cover that is mostly background, and that one color? Check. One big rock. Cover depicts something that didn't happen in the book? Mostly. Superman isn't wearing his suit, and he's outside when said scene occurs. Superman looks like he's defecating, passing gas, etc? Check. OOOH! And look at this! The color of his shield? Black. In the book? Yellow. Wow. Great editing, there. Cover rating one of five? Check.